↑ 1.0 1.1 Kosman, Joshua (November 2005). 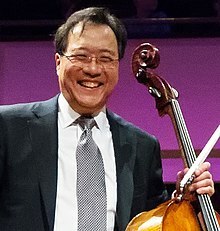 "35 Who Made a Difference: Yo-Yo Ma". Smithsonian Magazine. Retrieved July 29, 2016. ↑ "Yo-Yo Ma". United Nations Messengers of Peace. United Nations. Retrieved February 2, 2016. ↑ National Medal of Arts Archived July 21, 2011, at the Wayback Machine., National Endowment for the Arts. ↑ President Obama Names Presidential Medal of Freedom Recipients. Washington, D.C.: The White House. November 17, 2010. https://www.whitehouse.gov/the-press-office/2010/11/17/president-obama-names-presidential-medal-freedom-recipients. ↑ Pong, D. (2009). "Yo-Yo Ma". Encyclopedia of Modern China. Charles Scribner's Sons/Gale, Cengage Learning. ISBN 978-0-684-31566-9. ↑ Tassel, Janet. "Yo-Yo Ma's Journeys". Harvard Magazine (March–April 2000). Retrieved March 7, 2016. ↑ Covington, Richard. "Yo-Yo Ma's Other Passion". Smithsonian Magazine (June 2002). Retrieved March 7, 2016. ↑ "1". Faces of America. Season 1. Episode 1. February 10, 2010. PBS.